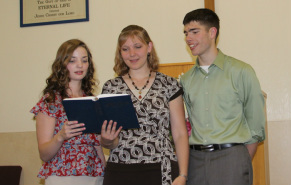 The music ministry is an important complement to the services here at Castlegar Baptist Church. Our music program is conservative with music that ministers to the heart, prepares us for the preaching, and gives us a desire to serve our great Saviour. We sing hymns and choruses that give honour and praise to the Lord.